Please let me know, so I can take it up a notch! 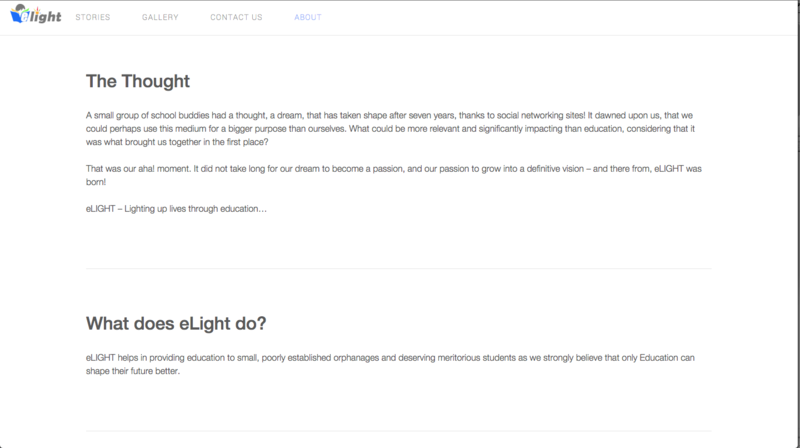 eLight is an aspiring NGO started by a bunch of school friends (myself included) to support educational needs of small and poorly established orphanages and deserving meritorious students. At eLight, we believe that only education has the power to redefine an under-privileged kid's future, and so we lend a helping hand to sponsor deserving meritorious students their higher education. Currently, eLight is operating in Southern India and expects to expand to the other parts of the world. 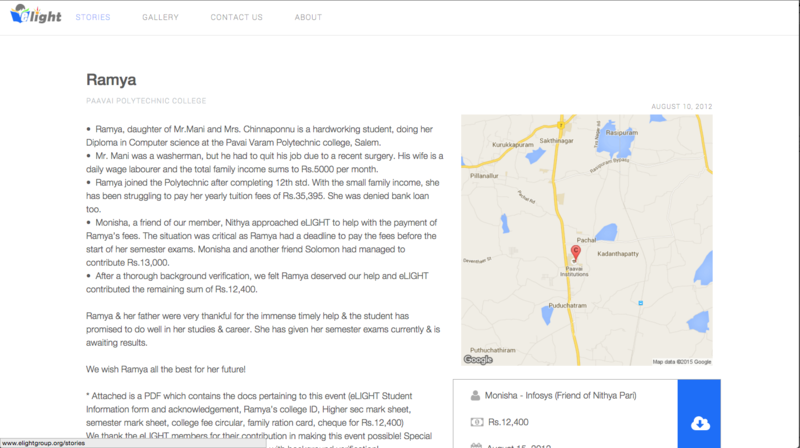 We've organized over 7 events and have sponsored over Rs. 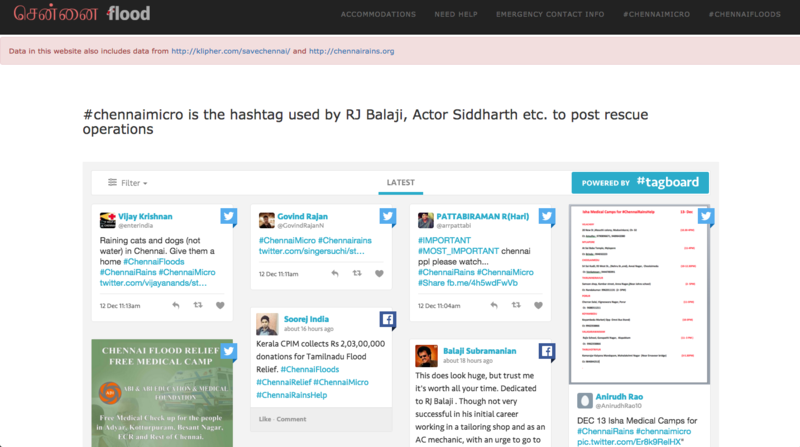 43,480 for children in Chennai and Salem Distrinct (in Tamil Nadu, India). If you like what we do and would like to know more. Please click here. Chennai, my home town was hit by one of the worst torrential rains in history and it caused flooding in most parts of Tamil Nadu. 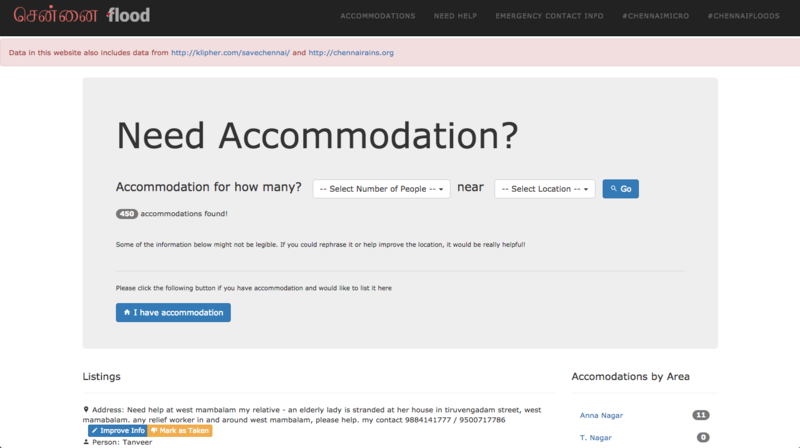 I put together this website to allow folks who had been displaced by the floods to find temporary accommodation and help NGOs find funds for relief efforts. 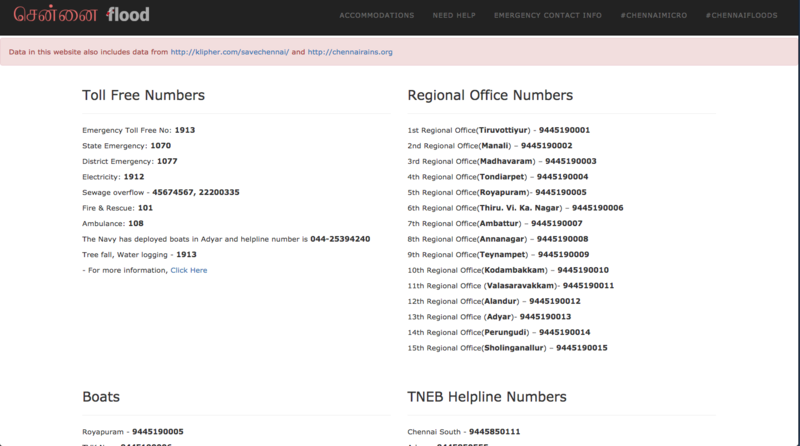 It was an open source application that provided CRUD functionality for accommodation, rescue ops, food supplies etc. and allowed folks abroad to follow social media about Chennai floods. 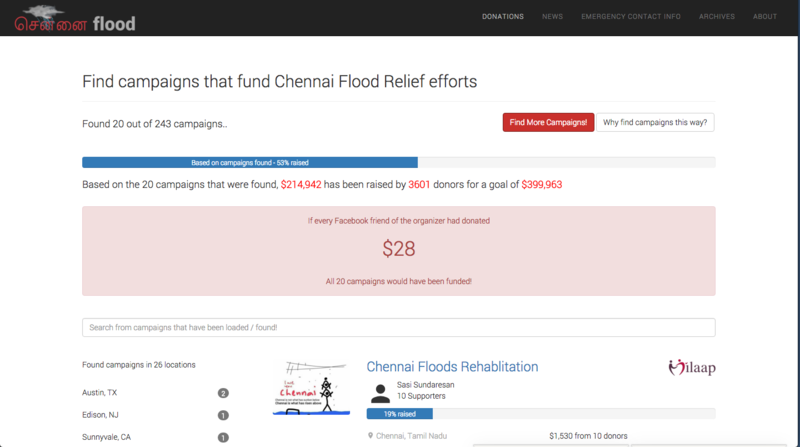 It also provided aggregated information regarding donations from social campaign sites such as Go Fund Me, Milaap etc. If you'd like to take a look at the application, please click here. I'm also working on an affordable Point of Sale system, a Content Management System, a Waste Management System (driven by permaculture) and an application to help build quadcopters / drones. I also build websites for free.. I try to build websites during my free time. 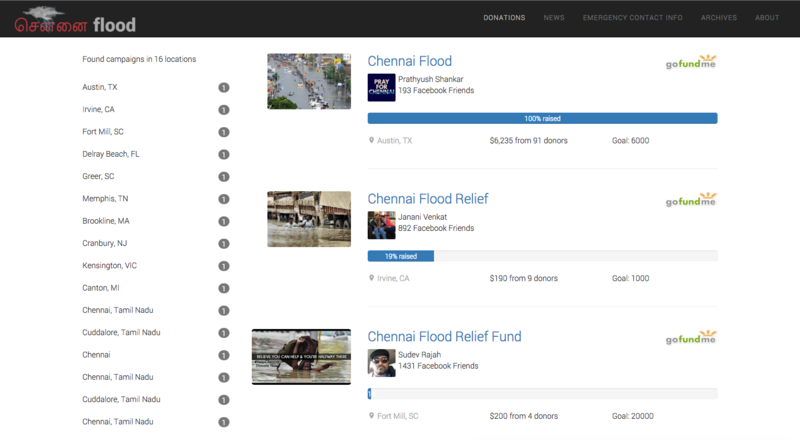 If you're a non-profit or a budding startup who needs a hand with a few things, I will help you (Free of Cost). You can reach out to me from the Contact page. Even though I build the websites for free, hosting and third-party services come with a price. I ask that you manage your account with corresponding hosting / the third party service and provide me appropriate credentials, so I can use them in the application. Since the application I will be building will be yours, you will have all the copyrights for the product. I do this to help folks. I'd be willing to sign patent agreements, NDAs and SLAs before you decide on have me on your project. For all the applications that I develop, I ask that you give some credit to me (whatever you see fit - In the About page or anywhere else with a font-size:1px). Please remember that I don't do this for a full time job. I only do this when I get time. So please respect that, even though I'd be going above and beyond to get your product done on time. The stuff I'd be building for you will have a lot of cool stuff (Consider yourself warned!). If you don't find it cool, feel free to dump it anytime! Don't sue me over it or anything (Be cool yo!). I will only be using open source libraries (following all the copyright guidelines). If you'd like me to integrate any third party services, you will have to bear all the costs incurred by the service. I will only use the third party services upon your approval and they will only be used for your project. I will not be responsible for any cost overrun or system failure caused by the third party services. Please keep reading, if you'd like more information. 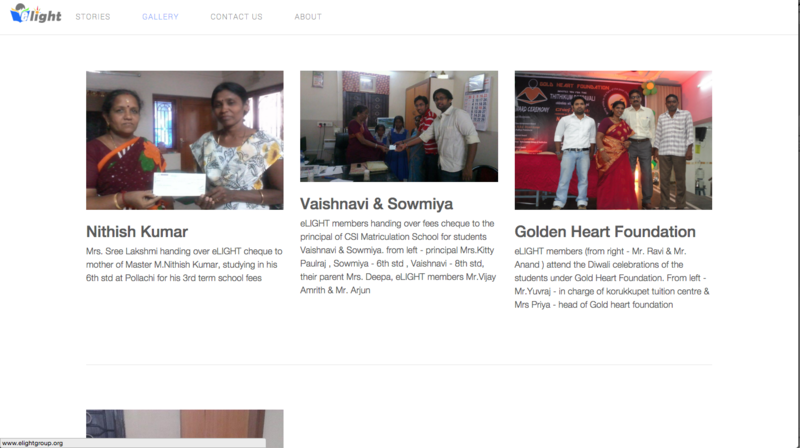 The applications I build are usually based on Twitter Bootstrap and Zurb Foundation. 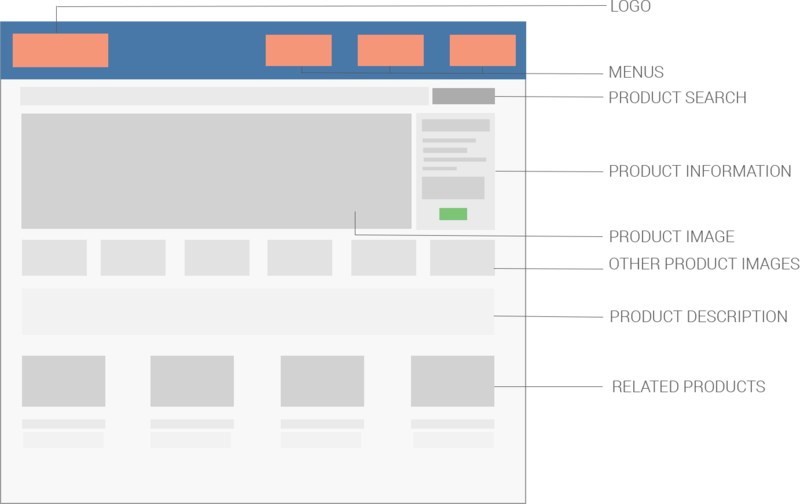 They're popular HTML5, CSS3 templates that help jumpstart the application design. 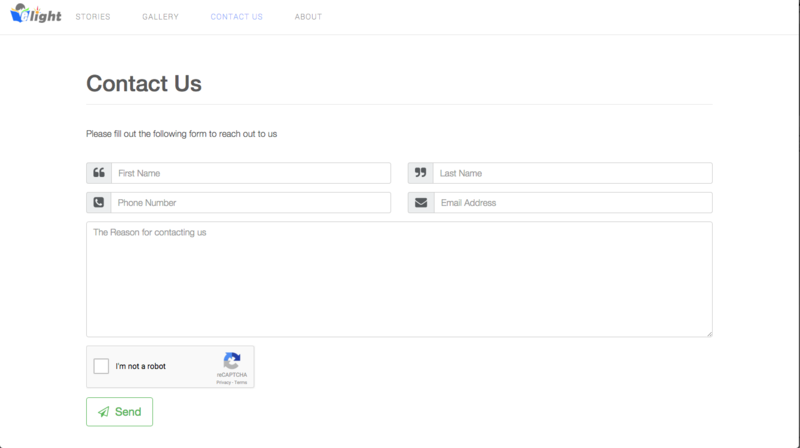 Looking for a simple marketing website? 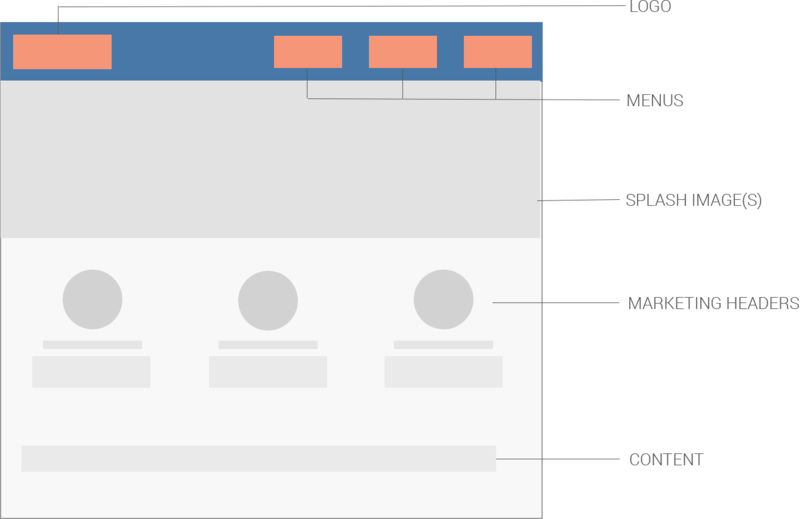 Here is a template that shows what your business does in a simple and intuitive way. A few splash images with key marketing messages and a section to display marketing headers by category. E Commerce applications usually involve a lot of background work, even though the front end looks quite simple. 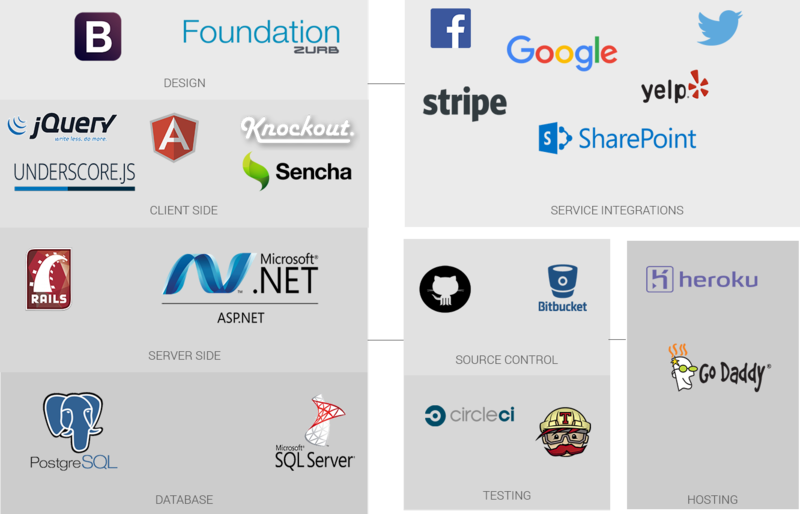 The web applications will be built using Ruby on Rails, Postgres SQL, jQuery and Angular JS. If you wish to add any third party services, I'll need the API Key and the Secret key for integration. If your application is open source and / or if I'm the only one that'll be working on the project, I can host it in Github as a public repository or work off of my local machine. If it's supposed to be a commercial application or if you intend to have the codebase as a private repository, I will need your Github or corresponding source control credentials. The web applications will be hosted under Heroku. Please check Heroku for their pricing. By default, the web server is pretty slow. But if you'd like a better performing web application, I'll be creating a Heroku account under your name so you and I can both manage the application. All costs incurred by hosting the codebase or the application will have to be taken care by you.